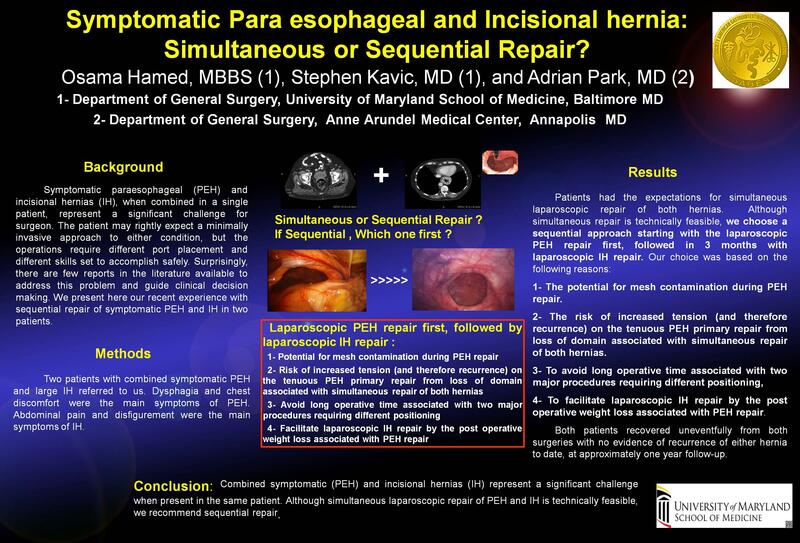 Symptomatic Para Esophageal and Incisional Hernia: Simultaneous Or Sequential Repair? Objective: Paraesophageal (PEH) may represent a significant challenge for the minimally invasive surgeon. Increasingly, we are finding this condition in patients who also have an incisional hernia (IH). The patient may rightly expect a minimally invasive approach to either condition, but the combination of conditions makes a single operation substantially more difficult to perform. Surprisingly, there are few reports in the literature available to address this problem and guide clinical decision making. We present here our recent experience with sequential repair of symptomatic PEH and IH in two patients. Methods: We present two patients with combined symptomatic PEH and large IH. The main symptoms from the PEH were dysphagia and chest discomfort, and the IH symptoms were abdominal pain. Interestingly, both patients were more affected by their IH than by their PEH symptoms. Results: These patients presented electively with the expectations for simultaneous laparoscopic repair of both hernias. Although simultaneous repair is technically feasible, we choose a sequential approach starting with the laparoscopic PEH repair first, and interval laparoscopic IH repair. Our choice was based on: 1, the risk of increased tension (and therefore recurrence) on the tenuous PEH primary repair; 2, to avoid prolonged operative time and compromised port placement; 3, the potential for mesh contamination during PEH repair; and 4, to facilitate laparoscopic IH repair by the post operative weight loss associated with PEH repair. Both patients recovered uneventfully from their proceudres with no evidence of recurrence of either hernia to date, at approximately one year follow-up. Conclusion: Combined symptomatic (PEH) and incisional hernias (IH) represent a significant challenge when present in the same patient. Although simultaneous laparoscopic repair of PEH and IH may be technically feasible, we recommend sequential repair.